A book review by my wife Tracy of The Fringe Hours by Jessica Turner. Women, by nature, are hard workers. Whether they work in the home, out of the home, or both, women give of themselves and serve others on a constant basis. 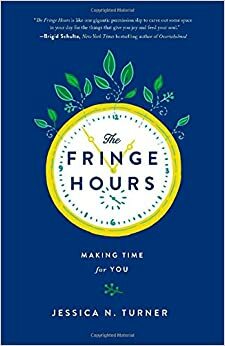 Jessica Turner’s book, The Fringe Hours addresses the very real need women have to find things they enjoy, and then find the time to do the things they enjoy! As a mom, I was encouraged and convicted by this book. Sometimes in the extremely demanding life of caring for three young children, I feel like I lose a bit of myself. Where is that woman who used to enjoy a variety of activities and actually had a few moments to pursue those things? Turner begins her book by freeing women from the guilt of spending time on themselves, as well as confronting the fact that women can be their own worst enemies by imposing impossible standards on themselves and comparing themselves to others. The second section of the book helps women uncover their passions and offers some very practical suggestions for how to find time in their lives to pursue the things they love. Yes, you have to get creative—Turner uses her morning hair-drying time as an opportunity to read her magazines—but as she points out, five minutes a day is enough to keep up with her subscriptions! The third and fourth sections offer readers help in organizing their time, accepting help, and overcoming other barriers to finding time for themselves. Turner also encourages us to make time to sleep and to build meaningful relationships into our lives. Self-care is a tricky topic because it can so easily become a very self-focused obsession. However, Turner tackles the topic carefully and builds her case well that taking care of yourself will help you be more fulfilled, happier, and will allow you more energy to care for others. She emphasizes the concept of balance in life which is a life-long pursuit for most of us. No book can make time for you in your schedule, but this book will encourage you to really look at your life and to revisit some of the things you used to love to do. The questions to answer and motivation prompts throughout the book make it interactive and help you start applying what you are reading right away. Overall, a well-written book with a timely message for today’s busy women! 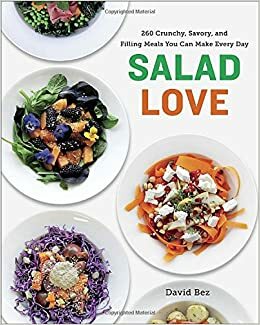 A review from my wife Tracy, on the book Salad Love by David Bez. Salad Love is one of my new favorite cookbooks! As someone who enjoys eating as healthfully as possible, and tries to incorporate as much produce in my diet as possible, this book is a wonderful addition to my cookbook collection. The book offers readers 260 salad recipes that can be eaten as side dishes, or as full meals on their own. Since the salads were originally designed to be prepared for lunches in an office building, the ingredient lists are short and the preparation time is minimal. There is also a picture for every single recipe—I love that! Another wonderful feature is that the book is organized seasonally. This allows readers to take full advantage of any local markets or farm stands that may be available. There are a few recipes that call for what I would consider to be slightly more exotic ingredients—quail eggs, octopus, and truffle paste to name a few—however, most of the recipes are completely doable and even quite affordable. Those that do make use of more unusual ingredients sometimes offer suggested substitutions as well. If you eat a lot of salad, or are simply looking for some variety from the standard tossed salad, give this book a try. You will be pleasantly surprised at how much you can love salad! This book was provided free of charge from “Blogging for Books” in exchange for my honest review. This rainbow was ‘in sight like unto an emerald,’ which is a precious stone of an exceeding lovely green color, so green that this color appears in nothing else so lively and lovely. This color is a most fit emblem of divine grace; it is a very lively color, not so dull as blue or purple, and yet most easy to the sight, more easy than the more fiery colors of yellow and red. It is the color of all the grass, herbs, and trees, and growth of the earth, and therefore fitly denotes life, flourishing, prosperity, and happiness, which are often in Scripture compared to the green and flourishing growth of the earth. As the benign influence of the sun on the face of the earth is shown by this color above all others, so is the grace, and benign influence, and communication of God fitly represented by this color. Now, no one can truly know the color most loved by the Divine, but truly at this time of year, with the vast outpouring of verdant hues it is of little surprise that Edwards might think that green would be the color of God’s pleasure. From the front porch of my house in the woods of Stanfordville, I gaze out at the trees becoming lush with leaves and the beauty and “life” of the many shades of green I see. It’s a glorious moment in the transition from the harsh brutality of winter to the lush warmth of summer for that moment of spring when suddenly barren trees spring to life. Is there a more beautiful picture of life than the green of spring? Far too often though, we fail to think upon or focus upon this momentous event that happens all around us. Gone are the days when we would, as children, gather leaves for pressing into assignments to note the variety of trees in our backyards. Gone are the childhood climbs into the branches of said trees to admire and appreciate the green around us. These and many other adventures and experiences among the flourishing greenery have been replaced with a weary thought that the mass of green will become a mass of brown simply to be cleaned up. Yet, it is the transition from green to brown to barren to green again, which should cause us to stop for a moment and focus upon that moment when life is restored and the green returns. As much as winter is a necessity, we mourn during it for the life that we saw during spring summer and into fall. When the leaves fell we mourned for the life for which we saw all around us and the impending foreboding of snow and harsh wind. Then, when seemingly winter would never end, life bursts forth, unable to be contained forever, and demonstrates that life conquers death. Is it any wonder that Edwards might have thought that God’s favorite color was green in that it rendered for us, in color, an “emblem of divine grace” since life so clearly conquers death (1 Corinthians 15:55). Just as Jesus Christ burst out of the tomb at Easter to show that death had no hold on Him (Acts 2:24), the green leaves burst out from the tomb of winter to show, in visible representation, that God’s grace is not bound, nay, can be bound, but is ready to burst forth in glorious abundance. You are currently browsing the Working out Salvation with Fear and Trembling blog archives for May, 2015.